It all began with Zee TV pioneering satellite television in India 25 years ago. What followed is a journey where the channel has been committed to presenting unparalleled content to its viewers. From introducing home-grown show formats such as Sa Re Ga Ma Pa, Dance India Dance and India’s Best Dramebaaz that celebrate the talent of the common man to presenting shows like Agle Janam Mohe Bitiya Hi Kijo, Saat Phere, Afsar Bitiya, Phir Subah Hogi, Pavitra Rishta, Doli Armaanon Ki and Punarviivaah, which questions the prevalent mindset and resonates with the ever-evolving sensibilities of the Indian middle-class, the channel has built a strong personal relationship with its viewers. Zee Rishtey Awards 2017 will witness a coming together of the entire Zee family as they collectively rejoice ‘Rishta Mubarak’. 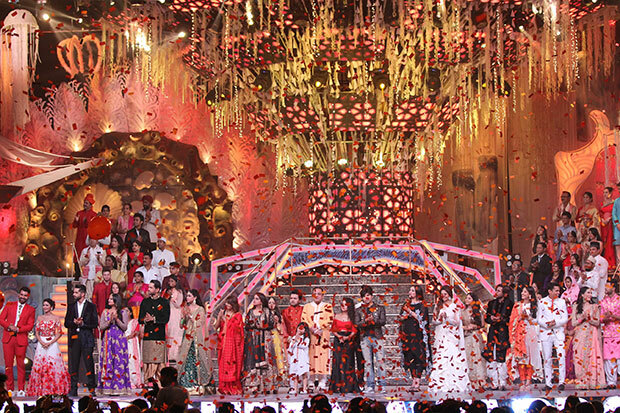 Year after year, Zee TV has carried on its legacy of celebrating the relationships within its family of actors, directors, producers, creative teams, technicians and the special one it has built with its viewers through its annual property 'Zee Rishtey Awards'. Commemorating 25 years of emotions and memories, the channel brought together the entire Zee family for a special celebration – The ‘Dabur Red Ayurvedic Gel presents Zee Rishtey Awards 2017 with special partners Nerolac Healthy Home Paints and Finolex Cables’, a glitzy awards soiree held at Mumbai’s NSCI Dome on September 10 and to be telecast at 7 pm on October 15 on Zee TV. The Zee Rishtey Awards 2017 will transport viewers into a world surpassing the boundaries of their imagination with a specially created ‘Silver Jubilee Futuristic’ theme. The red carpet will be themed as a ‘Walk down memory lane’ with hosts Asha Negi, Rupali Jagga, Jaskaran and Preetjot reminiscing about the artists’ fun-filled memories. Future will be the flavour of the evening with star-studded performances. The opening act will feature the the main leads of all its current primetime shows. Zee TV’s iconic jodis – Agle Janam Mohe Bitiya Hi Kijo’s Laali (Ratan Rajput) and Shekar (Abhishek Rawat), Doli Armaano Ki’s Urmi (Neha Marda) and Samrat (Mohit Malik), Qubool Hai’s Sanam (Surbhi Jyoti) and Aahil (Karanvir Bohra) will also recreate the magic of their on-screen love stories. India’s favourite television couple Abhi-Pragya (Shabbir Ahluwalia and Sriti Jha) will redefine romance with a visually brilliant act. Zee Rishtey Awards 2017 will also commemorate the bonds fostered with talent like R Madhavan and Ankita Lokhande who have gone on to make a mark for themselves after a glorious kick-start to their careers with Zee TV. Celebrating her unparalleled success in the world of television and films, there will also be a special award presented to Ekta Kapoor who debuted as a producer with Zee TV.